When you buy GeForce RTX, you get Battlefield V. You can also win RTX graphics cards by capturing your favorite War Stories screenshots. 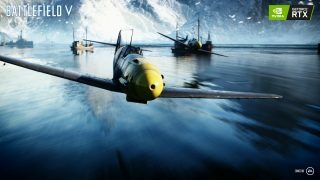 If you play Battlefield™ V on PC, you’ve got the chance right now to upgrade your rig’s graphics card with the SHOT WITH GEFORCE: Battlefield V Ansel contest. NVIDIA and DICE Stockholm are teaming up to give three lucky winners the opportunity to experience mind-blowing graphics and performance. But what if you don’t own Battlefield V? NVIDIA’s new Battlefield V bundle has you covered, bringing together powerful GeForce RTX graphics cards and a copy of the game. Get all the details on the bundle and contest below. Our friends at NVIDIA are offering an awesome bundle for PC gamers. 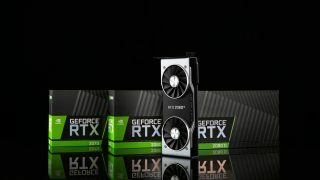 For a limited time, when you buy select GeForce RTX 2080 Ti, 2080, or 2070 graphics cards or gaming desktops, you get a copy of Battlefield V.
GeForce RTX GPUs provide the ultimate Battlefield experience on PC, giving you super high framerates at the highest detail levels, and the option to enable the first release of DXR real-time ray tracing. Check out NVIDIA’s Battlefield V bundle page to discover which GeForce RTX 2080 Ti, 2080 and 2070 graphics cards are eligible and where you can buy them. Calling all war photographers: We want to see what you can do on the battlefield. Share your best Battlefield V War Stories screenshot, and you could win a GeForce RTX graphics card. One grand-prize winner will receive a GeForce RTX 2080 Ti. Experience graphics reinvented with NVIDIA’s newest flagship graphics card. Its powerful NVIDIA Turing™ GPU architecture, breakthrough technologies, and 11 GB of next-gen, ultra-fast GDDR6 memory make it the world’s ultimate gaming GPU. Our first runner-up will receive an awesome GeForce RTX 2080 and our second runner-up will receive a GeForce RTX 2070. Download the latest version of GeForce Experience if you haven’t already, to enable Ansel in Battlefield V.
Play Battlefield V in the single-player War Stories mode on PC and start capturing those hero-worthy moments with NVIDIA Ansel. Whether it’s a dramatic shot of an exploding Luftwaffe aircraft in Under No Flag, or a panoramic view of the Norwegian mountains from Nordlys, we’re betting you’ll be able to capture some amazing shots and we can’t wait for you to share them. Enter as many screenshots as you want between November 20, 2018, and December 16, 2018. For complete rules and eligibility, please visit the contest page. Good luck and see you on the battlefield.